No matter the time of year, the delicate motion of this natural hair can attract the biggest trout. Bucktails are close cousins to streamer flies and share a long and rich history on streams around the world. Classic volumes, such as Col. Joseph Bates’s Streamers and Bucktails: The Big Fish Flies, are entirely dedicated to long flies. Even the ardent wet fly angler Ray Bergman included a lengthy chapter on streamers and bucktails in Trout. This tradition is far from dead, as new and effective bucktail patterns are springing from the vises of innovative tiers every day. Bucktails and streamers serve the same dual purpose: to either imitate baitfish or serve as fish-attracting lures. The distinction lies in the wing materials. Streamers have long feather wings, while bucktails are tied with wings of, naturally, bucktail. 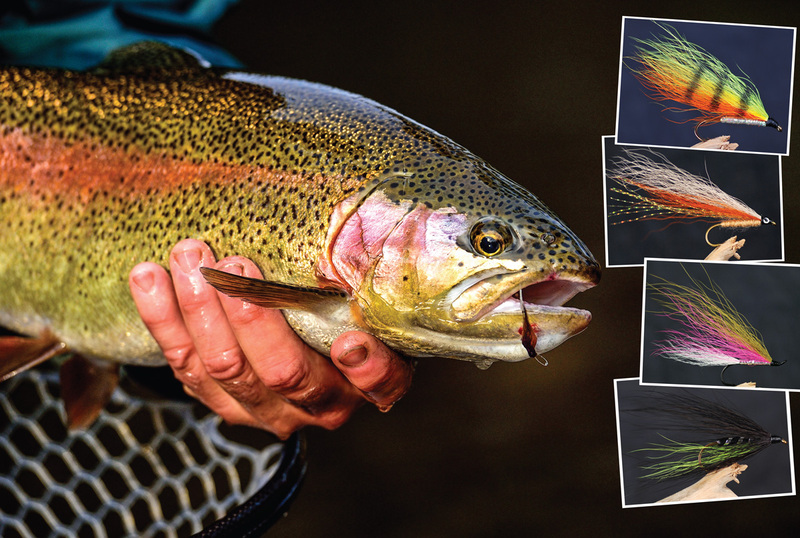 The long, flowing feathers of a streamer add action, but can be difficult to tie and are prone to fouling around the hook. Bucktails are easer to tie and don’t foul, combining a simplicity of form with an attractive motion of a natural material. HOOK: Streamer hook, sizes 6 to 10. WING: Chartreuse over yellow over orange bucktail. NOTE: Look at any fishing catalog, and you’re sure to find plenty of fire tiger lures. Place an index card on the desk, put the fly on it, and hold another index card against the fly to guide your marker lines. That way, the lines will be straight and you won’t get black stripes on your desk. 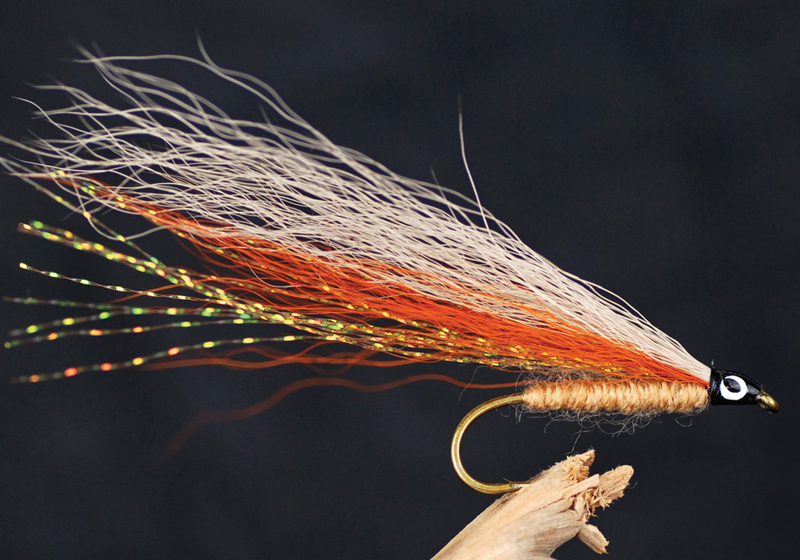 Part of the allure of bucktails is that, unlike dry flies and nymphs, they will catch fish throughout the year, and in the right hands, can tempt trout, bass, and just about any other piscivorous fish. There are few materials, natural or otherwise, that can mimic baitfish like bucktail. To trout, even sluggish winter trout, an injured baitfish represents a lot of calories in one quick bite, making it hard to turn down an easy meal. Here’s a quick journey through the seasons and a look at how you can catch trout with bucktails in any month. Because of snowmelt and rain, spring trout are often buried in deep, cold, murky water. In these conditions, trout tend to hold near the bottom or around obstructions where the current is not so strong. You might also find trout holding in areas that are normally inaccessible to them, like along steep banks or among trees that are usually above the waterline. This situation presents anglers with three questions: First, how do you find the fish? Second, how do you get your fly down to them? And finally, how do you get them to eat it? BODY: Tan yarn or wool. WING: Tan over burnt-orange bucktail. EYES: Painted-on thread head (optional). NOTE: I first tied this fly to imitate a specific baitfish that’s common in the smallmouth streams around west-central Indiana. The pattern has since proved itself effective on trout streams where sculpins abound. We all wish there were an easy answer to the first question, but the fact is, finding fish in a blown-out spring river can be difficult. Rather than taking a shotgun-style approach and trying to cover every square inch of water with your fly, look for pieces of water that stand out. Pocket water and currents that are broken by bridge pilings or other obstructions are some of the most obvious places to throw a bucktail in high springtime water. Less obvious are the current seams and eddies that indicate some sort of underwater structure impeding or altering the current. The slack water in eddies, current seams, broken currents, and pocket water makes all these locations ideal for trout and for trout anglers during the spring runoff. The answer to the second question is much simpler. In order to get your fly down to the fish, you’ll need to sink it. You can either sink the fly with added weight or use a sinking fly line to do the work. Heavily weighted bucktail flies like Clouser Deep Minnows will solve this problem in a hurry, but since we’re talking about bucktails in a more traditional sense, let’s consider how you can make a deepwater presentation with a standard, nonweighted bucktail on a sinking fly line. Target shooting is a direct approach to fishing the most promising lies with a bucktail. Simply cast your fly as close as you can to likely targets like fallen timber, overhanging brush, and mid-stream boulders. Then strip your bucktail through the targeted area to tempt trout out from the cover. We’ll go into more detail later, but there are some key tactical points to remember when fishing bucktails with a sinking fly line during the spring runoff. First, visibility is low in high spring water, so you need not worry about long leaders. Second, use large, dark patterns or flies with a bit of fluorescent color to attract trout. Finally, avoid using a strike indicator, as this will keep your fly from getting down to the fish. Instead, keep your finger on the fly line and watch the point where the fly line enters the water to detect any strikes. HOOK: Streamer hook, sizes 2 to 6. 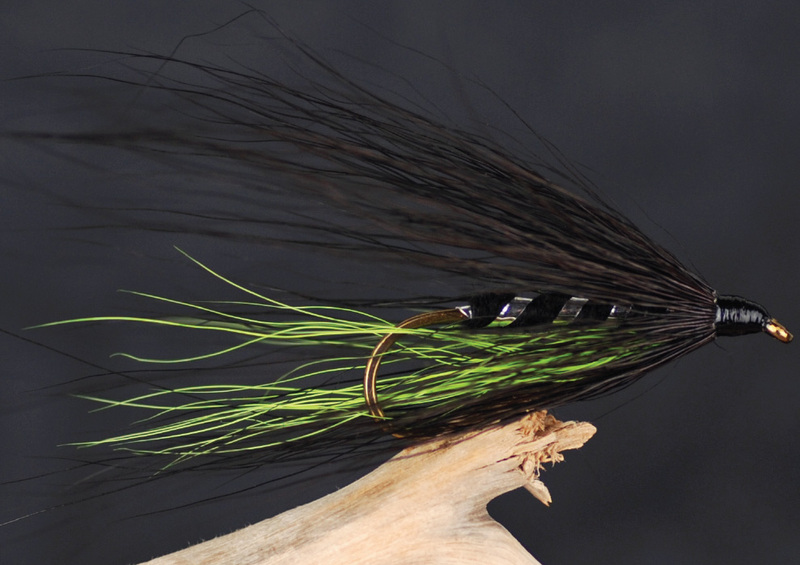 BELLY: Black under chartreuse bucktail. Streams typically return to “normal” conditions as spring rains and runoff subside. Flows are lower, sediment drops so the water is clearer, and warmer temperatures increase the metabolisms of both prey and predators. Many trout anglers think of summer as the time for matching the hatch or swinging wet flies. There’s no doubt that these techniques will catch fish, but don’t discount the ability of bucktails to catch trophy fish when the temperature rises. It stands to reason that bucktails draw strikes from the biggest trout because they represent larger forms of food. Have you considered, however, that bucktails draw more strikes because trout are willing to move farther for a larger meal? Trout that are feeding on insects generally hold in a lie, waiting for insects to drift by. In contrast, trout that are big enough to eat other fish at tack from cover, moving much farther than their insect-sipping brethren. Target-shooting undercut banks, fallen trees, pocket water, and current seams with a bucktail will draw fish from their lies and produce strikes during the summer months. Fishing bucktails between hatches will extend your summer fishing, as well. All hatch-chasers know that an actual hatch can last anywhere from minutes to a couple of hours. Trout seem to appear out of nowhere when an insect hatch occurs. You know they are still around after the hatch, and knowing that the trout are there is half the battle. Go ahead and fish the hatch because it’s fun, but stick around and swing a bucktail through the area after it’s over. Think of it as offering a main course after the appetizer.